THE REVIEW: The Bling Ring is based on actual events. Between 2008 and 2009, a group of teenagers robbed approximately $3 million in cash and belongings of famous celebrities. You might expect it to be a high-octane heist film and given the trailer, you would be forgiven for thinking so. However, The Bling Ring is not a heist film and it’s not action-packed, intense, or even remotely suspenseful. In fact, it is remarkably slow-paced and uneventful despite the film being about robberies. As other students in my class pointed out after watching the film, this was probably done intentionally by director Sofia Coppola as a way to not glamorize and glorify the actions of these delinquents. Many students cited this as a reason for liking the film. I on the other hand, do not share the same sentiment. 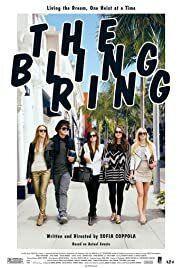 Much of The Bling Ring is repetitive, drawn-out, and superfluous. If you look at the film from an objective point of view (i.e. how many things/events happen), not much does happen. There’s might be a dozen or so robberies, a handful of party scenes, and some filler which takes place at school or at home. Then look at the robberies or the party scenes individually, the format is pretty much the same. Identify a target, enter the home, find some cool swag, have Marc Hall (Israel Broussard) say how he thinks this is a bad idea and they should leave before everyone gets caught, and then finally return to their cars with piles of expensive clothes, jewelry, and stacks of cash. Party scenes, even more boring. Show up, blast music, get drunk, leave. Sofia Coppola certainly accomplishes making the actions of these teenagers not something to aspire to. None of it seems fun or cool and the adrenaline rush the kids get out of robbing is all short-lived. But there’s a difference between having a point you want to convey to the audience and actually getting that message across in a meaningful way. Coppola certainly has a message she wants to get through: there’s no reason to rob celebrities for their prized possessions. Why? It doesn’t mean anything. At the end of the day, it’s just a new dress or a pair of shoes or a necklace. The only reason they’re coveted is because it is Paris Hilton’s dress, or Lindsay Lohan’s pair of shoes. My issue with the film is that this message doesn’t come across clearly. Don’t try and show it by making a boring, repetitive, and painfully slow film. After a while I had to consciously tell myself what was happening. (“Ok, they’re going into another home now. Stealing stuff and… yawn… uhh? Where are we? Oh, they’re still stealing fawning over some gaudy monstrosity.”) Trim the fat and get to the point. You can still make an exciting and suspenseful movie while still making the characters’ actions boring and pointless. Another problem, the film places too much (misdirected) attention on Nicki Moore (Emma Watson) and her family. Based on the trailer and having watched the entire run of Pretty Wild — which follows Alexis Neiers (who Nicki Moore is based on) and her family as the drama unfolds (Alexis is arrested in the pilot) — I assumed Nicki was the ringleader. She’s not. Rebecca Ahn (Katie Chang) and Marc are the ringleaders (based on real life Rachel Lee and Nick Prugo). While I applaud Leslie Mann for a absolutely spot-on performance as Laurie Moore (based on real life Andrea Arlington-Dunn), there is no meaningful reason to present her as a background character. Nor is there a reason to include Laurie’s homeschool curriculum that’s based on The Secret. THE TAKEAWAY: Overall, I would say The Bling Ring is just disappointing. Sofia Coppola has good intentions, the gist of which shines through, but it does so in a way that’s incredibly dull and boring to watch. As I said earlier, you can still make an exciting movie while still making the characters’ actions boring. Instead, the two are one and the same and the result is a movie with a lack of focus, direction, or meaning. But really though, big props to Leslie Mann for her performance. Scarily accurate depiction of the mother.